These peanut butter oatmeal bars are super quick, easy, no-bake and naturally gluten-free and 100% whole grain. With a vegan option. So it’s been three weeks since I last posted and that was a re-post of an old recipe. And here’s another – with new pictures and a video. Sorry to my long-time readers! Our little guy is 5 months old and I get a few minutes at a time, maybe 30 all together throughout the day, in the kitchen. That’s been making recipe testing nearly impossible. I like to use those few minutes to actually eat. :) But luckily I do have some new recipes on the way! These peanut butter oatmeal bars are basically candy bars using healthier ingredients. And it couldn’t be any easier! You just melt a bunch of stuff together, put it in a pan, chill and cut into bars. 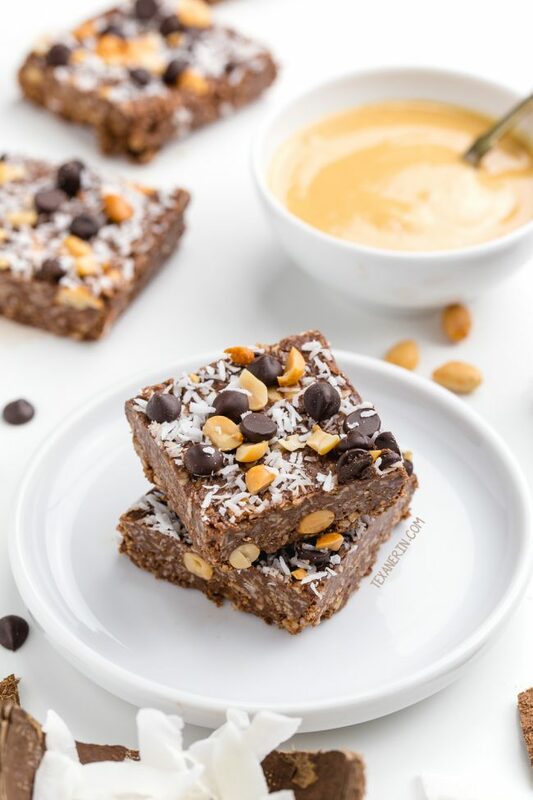 I love honey and peanut butter together so that’s what I used but I’ve also tried these with brown rice syrup and it works just as well for a vegan version! I haven’t tried these with maple syrup. It’s a whole lot less thick and sticky than honey and brown rice syrup so I can’t say for sure that it’d work. Just don’t go so crazy with the add-ins that the mixture no longer holds together easily. Want a less sweet version? Use dark chocolate. Want a slightly naughtier version? Add in some peanut butter chips (which aren’t vegan / dairy-free)! Don’t want to use peanut butter? Almond butter and chopped almonds are a delicious alternative! I also like to add a little almond extract to that version. Hope you’ll enjoy them! Try these Homemade KIND Bars for something a little healthier if these are too much on the unhealthy side for you. Questions about these peanut butter oatmeal bars? Can I use something else in place of the coconut oil? Butter should work fine! Not olive oil or any liquid oil. Can I use something other than peanut butter? Almond butter works great! I’m assuming other types of natural nut butter, without any added fat or sugar, would work fine. Nut butters aren’t always exchangeable but since this a simple no-bake recipe where you just mix everything together, I think it’d be fine. Can I use something else other than honey or brown rice syrup? Granulated sugars wouldn’t work. Maple syrup might work but it’s less thick and sticky than honey and brown rice syrup so I’m not 100% sure. Can I use white chocolate instead of semi-sweet chocolate? I haven’t tried it but I’m thinking it’d be a little too sweet. Can I reduce the sweetener or amount of chocolate? You can definitely play around with this recipe. I tried it out a bunch of times and thought it was best as written below. I’m guessing omitting the 3 tablespoons of honey would be ok for a less sweet version. I think it’d still hold together fine. Can I omit / use something instead of coconut? Together with the oats, the coconut forms the bulk of the recipe. So I wouldn’t just omit it, but I can’t think of a good sub. Maybe more oats? Can I use something else in place of oats? Maybe quinoa flakes? I personally don’t like them but they should work. If you can have gluten, spelt flakes, emmer flakes, or whatever-flakes should work! I haven’t tried any grain-free alternative. Melt the coconut oil in a medium pan or pot over medium-low heat. Add in the peanut butter and honey and when thoroughly combined, add in the chocolate chips. When melted, add in the coconut and oats. Let cool for 5 minutes and then stir in the peanut butter chips or peanuts. Line an 8" x 8" pan with a piece of parchment paper or wax paper. Press the candy into the pan and top with the extra peanuts and coconut, if desired. Let chill for about 2 hours or until firm and then cut into bars. Store in an airtight container in the refrigerator. The bars will stay good for several weeks. 60 comments on “Peanut Butter Oatmeal Bars” — Add one! They look great! I would surely try this one tomorrow but i would like to roast the coconut flakes & rolled oats and use dark chocolate. Can I use unsweetened chocolate baking bar as a substitute for those chocolate chips? I haven’t tried it (we don’t have unsweetened chocolate where I live) but I’m guessing it’d be fine. Just know that you’ll likely have to add quite a bit of sweetener. I’d love to hear how it comes out! Erin, I’ll be making these with Lily’s chocolate chips tonight. Can’t wait! These look delicious. I wonder if there is any information on the number of calories in each bar if made as per this recipe. Thanks!! Thanks! I don’t have that info but you could use this recipe analyzer if you’d like. :) Hope you’ll enjoy the bars! Absolutely delicious! I made these for a staff breakfast and the bars were devoured. I made a slight adjustment by adding 2 scoops of collagen, protein powder to the recipe. Thank you for sharing!!! What a great addition! Thanks so much for your comment. :) I’m happy that they were enjoyed! Hi there! I’m so very sorry for just now seeing your comment (that landed up in spam for whatever reason). I hope that eating gluten-free has become easier since you left your comment and that you’ve been able to try some of my recipes out (and that you’ve enjoyed them!). Sorry again and thanks for your nice comment. I made these earlier last year and they were awesome. And then made them twice this past weekend….Big hit again as well. I love how good they are and how quick they are to put together and how everyone but one kid (allergic to nuts) in my household loved them. Thanks for the recipe! I tried these and they are absolutely delicious. 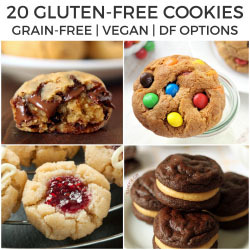 I am gluten free as well as low sugar so I only used 1/2 C. chocolate chips and eliminated the peanut butter chips and they were still plenty sweet. I also used unsweetened coconut to lower the sugar a little more. I did put some coconut and peanuts on top, but I don’t think you really need it. Yum! Just made these and ate way too many!! Well I’m happy you liked them enough to eat too many! ;) Thanks so much for the feedback! 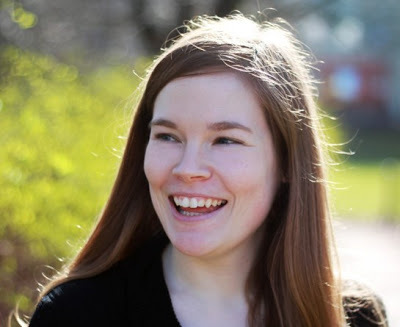 Erin, I came across your site because I was looking for gluten-free and dairy-free recipes while breast-feeding. My baby had a sensitive belly for the first 5 or 6 months. This recipe was great. 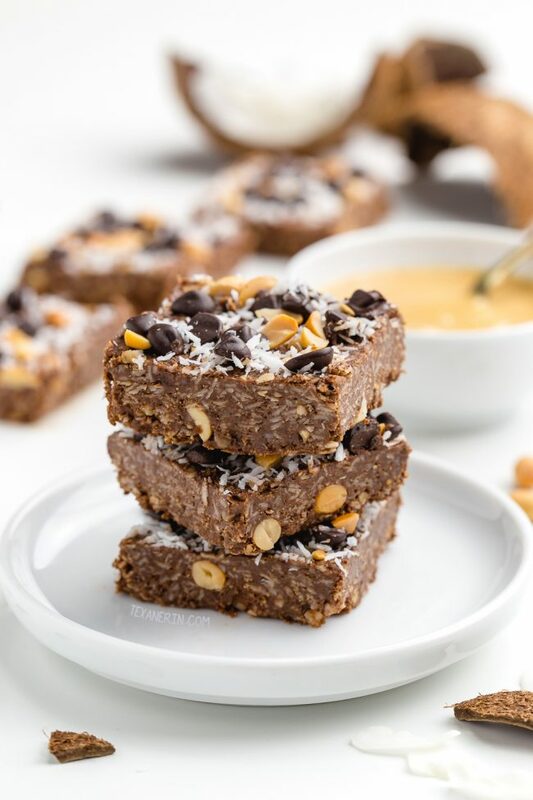 I loved it, but it also has a few ingredients frequently used in lactation cookies; so, as a gift for a friend, I made some lactation “candy bars”–your recipe with a little brewers yeast, fenugreek, and cinnamon thrown in. I am not a fan of brewers yeast, but apparently, I’m in the minority. They were a big hit. Hi Brooke! I am so sorry for my slow reply. I don’t know how I didn’t see your comment until now! I love how you turned these into lactation candy bars for your friend. So sweet of you! :) And you’ve inspired me to be better about adding the dairy-free tag to my posts. I’ve been doing this for the past few months, but I’m slow to update the older posts with the tag. I’ll get on that! Thanks a bunch for taking the time to leave some feedback and for leaving a rating. Sorry again for the slow reply! Sorry for the slow reply! I’m so happy that you liked the bars. I wish I had one now instead of this bowl of spinach. ;) Thanks a bunch for the feedback! Walnuts Chopped(or Pecans, ..Peanuts..Cashews.. whatever I have) and drizzle a little honey ontop and bake 350 for 25 mins. Apple butter and protein powder?! These sound interesting! And kind of crazy (and awesome!) like you said. ;) Thanks for sharing your version! You now have me thinking of a fall apple filled bar. With lots of spices! Lou Anns Coconut oil can be purchased fairly cheap at Wal-Mart… its usually around 6$.. but I find myself in a position where my cousin is allergic to coconut so is there substitutions to coconut in this recipe? Butter would work just fine for these! At least I'm pretty sure it would. These bars should be refrigerated after all so I can't think of any issues that would come up. I hope you all enjoy them! I tried to comment on these from my iPad and I couldn't so I am back now! These look awesome. Probably a good thing that the giveaway is over because I work with Kelapo coconut and shouldn't enter it! ;) I am pinning these. I love your blog, all of your recipes are so interesting and different! This one in particular looks super delicious, coconut and peanut butter sound like a match made in heaven. I adore coconut but have not gotten on the coconut oil bandwagon. I see it at Trader Joes and just need to pick up a jar. Your bar cookies look easy and tasty. Delish!!! These bars look sinful so I love all the more that they're healthier! 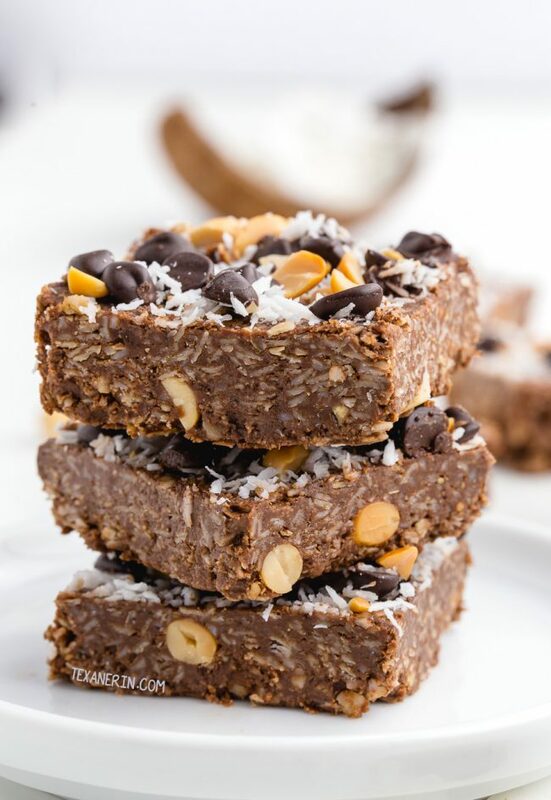 Coconut and chocolate is one of my favorite combo and these look amazing Erin. I love baking with coconut oil, great substitution to butter in most of the recipes. Now I have to try using coconut with peanut butter. Dude, these bars look like they're too dangerous to have around the house! 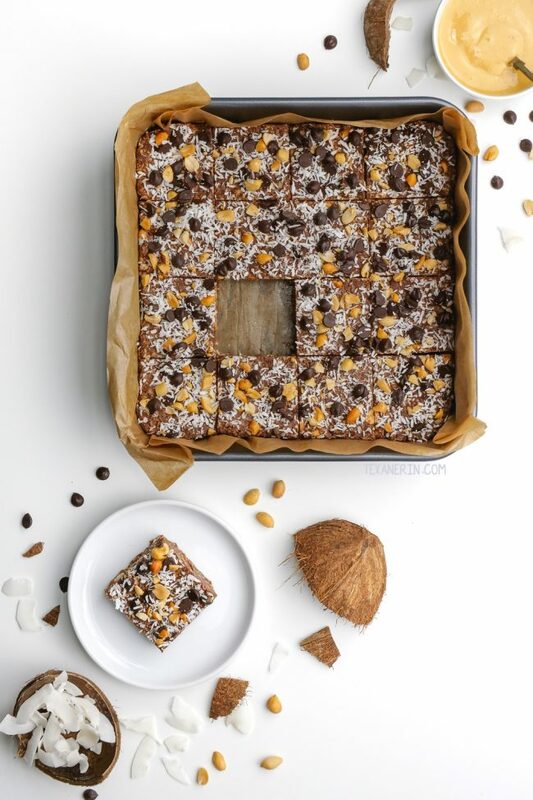 It's time for me to finally get on the coconut oil bandwagon, these bars look ah-mazing!! These bars look perfect for a picnic or hike, they sound not only delicious but so healthy too, YUM! Erin, these bars look amazing. I just discovered coconut oil, too. I love the stuff! I love this bars, they just look like something I did not long ago minus the peanut butter. They were superb and I am sure these were too. I love anything no bake!! i haven't used coconut oil other than in granola but i want to experiment with it more. Yum these bars look really good, I love all the ingredients here. I think I could eat the whole pan. Coconut oil is pretty much my BFF. Love these bars, Erin! What a great recipe! Printing it and saving it for the weekend, when we'll have company over. The pictures got me dreaming of these delicious-looking bars and a cup of coffee! I just baked with coconut oil for the first time this past weekend, and I was so in love with the result! I can't wait to try other recipes :) These bars look absolutely amazing, love the combo of ingredients going on! These look amazing! You had me at no bake! I am a fan of all things no bake. I am going to try this soon. Thanks! You had me at "healthier candy bars"! Love these, Erin!